According to a recently published study1 by radiology professor Tommaso Bartolotta from the University of Palermo in Italy, S-Detect™ for Breast has shown to assist various degrees of improvement in the overall diagnosis of breast lesions. When using S-Detect™ for Breast, the diagnostic accuracy for doctors with experience of four years or less improved from 0.83 to 0.87 (AUC, Area Under Curve). S-Detect™ for Breast could be a useful tool for supporting and guiding breast diagnosis among non-expert breast imaging physicians (Only shape and orientation descriptors are automatically classified in the United States). Digital Radiography – By using AI technology, the ‘Bone Suppression’ function, which reduces the bone signal from the chest x-ray image, clearly brings out the lung tissues obscured by the bones. ‘SimGrid™’ has also been introduced as a solution to ease the workflow to replace grids, while providing excellent image quality with reduced scatter artifacts. According to a recently published study2, ‘SimGrid™’ provided image quality almost as good as the images taken with a physical grid. The Auto Lung Nodule Detection (ALND) is a CAD (Computer Aided Detection) solution based on AI technology used in the detection of lung nodules and is 510(k) pending. According to a recent study3in press in Journal of Thoracic Imaging, ALND improved the detection sensitivity of lung cancer nodules 3 cm or smaller in chest radiographs by seven percentage points to 92 percent, compared with the average of six chest radiologists. Computed Tomography – Samsung has introduced the intra-cranial hemorrhage package that combines a mobile stroke unit with a radiological computer aided triage and notification solution based on AI technology. Magnetic Resonance Imaging – Utilizing AI technology, Samsung is developing a technology to display information such as knee cartilage thickness as well as images of knee arthritis patients. The software is a prototype and not for sale in any region of the world. 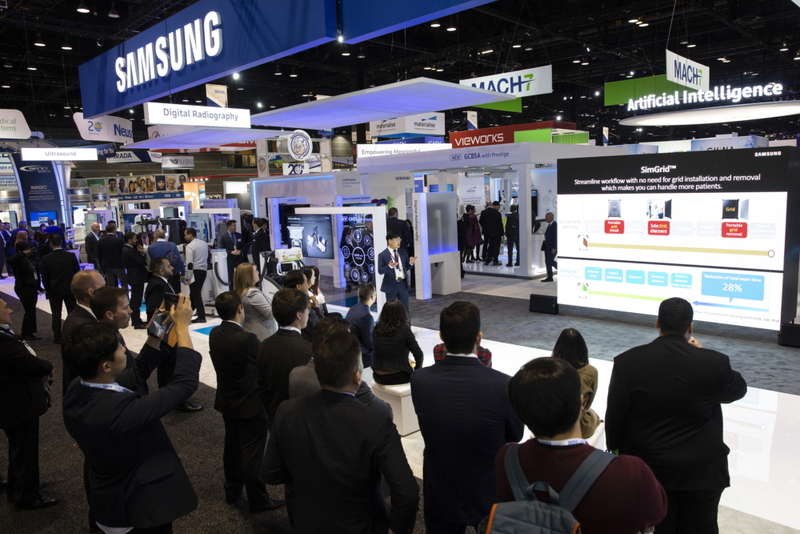 Through the release of new diagnostic tools that utilize diverse data based on AI technology, Samsung will continue to support healthcare professionals to improve the diagnostic accuracy. For more information on Samsung’s healthcare business, and products, please visit https://www.samsunghealthcare.com. Samsung Medison is a global leading medical device company, founded in 1985. With a mission to bring health and well-being of people’s lives, the company manufactures diagnostic ultrasound systems around the world across various medical fields. In 2011, Samsung Medison became an affiliate company of Samsung Electronics, integrating world’s best IT, image processing, semiconductor and communication technologies into medical devices.